I haven’t blogged in over a year and here I am starting with an entry that has nothing to do with bicycles. But not to worry, I’m still interested in bicycles and plan to write about them in addition to my life on a new continent. When my husband Matt suggested that he try to find a job in Austria, I only half believed that it would actually happen, which made it a lot easier to agree to the idea. Even when he had two job interviews followed by a job offer, I still wasn’t sure we would actually manage to pack up our life and move to another continent, especially with our six-month old daughter and a cat. And yet, here we are. It turns out that neither the baby nor the cat were especially difficult to travel with and that our minor misadventures were not caused by them. Despite having read a friend’s account of successfully moving to Kazakhstan with her cat, I was particularly verklempt about every aspect of moving him. Haakon was fine. He had started sleeping in his travel case before we left and we didn’t hear a peep out of him the entire move. We didn’t even need to sedate him. The most challenging part of moving him was that he had to be alone in our new apartment while we stayed in a hotel. As I type this he’s sitting about two feet away from me, perfectly content. Moving with the baby was more challenging, not so much because she was all that difficult to travel with but because babies require a lot of stuff. One Mira, plus a diaper bag, baby clothes and other supplies, a travel crib, a car seat, and a stroller adds up to way too much to transport. On a friend’s recommendation I wore her through the airport, which was definitely the correct choice. For one thing, she’s happiest when worn facing out and for another it allowed us to use the stroller to carry many of her supplies that weren’t checked luggage. We flew from Minneapolis to Newark and from Newark to Vienna. We got to the gate in Minneapolis only a few minutes before families with small children were invited to board. She actually slept most of the first leg of the journey, which was uneventful. Then we got to Newark where we disembarked only to find that we had to walk down a rickety ramp and then up a flight of stairs. I’m not sure how someone traveling in a wheelchair or alone with a baby would have made it. Matt had assistance portaging the stroller, at least. Then we got to the desk to get boarding passes for our Austrian Air flight, only to discover that United had failed to check us in and we’d lost our seats (though it wasn’t a full flight, so we weren’t in danger of not getting on the plane) and thus the bassinet. While someone contacted Austrian Air to fix our problem a fire alarm randomly went off and continued to blare for several minutes, which only added to the comedy of errors. Fortunately, they were able to move people around, so we were able to get the seats we’d originally been assigned. I highly recommend Austrian Air. United Airlines and Newark airport, not so much. We didn’t purchase a separate seat, but we did have a tiny baby seat belt to attach to one of our seat belts during take-off and landing. The bassinet looks like some kind of miniature baby prison, but Mira slept in it for several hours. We hired porters in the Vienna airport to help transport us and our massive amounts of stuff. Doing so also meant we skipped the customs line, making it well worth the 100 euros we paid. We left a lot of our luggage overnight at the airport and took a more manageable amount of our possessions to Linz via the train. Fortunately, our new apartment is a four minute walk from the central train station. We were, of course, exhausted, but actually getting from Minneapolis to Linz was far easier than expected. Somehow we even managed to get from the airport to our apartment for a noon appointment at exactly 11:59. Dealing with a jet-lagged baby, however, was a much more challenging experience, but not one worth recounting. To the surprise of no one, finishing my dissertation took up absolutely all of my writing energy. So now that I’ve done with my Ph.D. (a day that seemed unreachable), I now can return to exploring this topic in a more accessible way. For my research, the written sources I used were written for a public audience. Most of the articles and all of the cycling guides were didactic. That is, most writers were attempting to teach their readers about cycling, which frequently included advice on how to dress. Granted, I was looking for information on women, which may have biased my methods, but I found much more advice on how women should dress as compared to how men should dress. In the future, I would like to dig more deeply into men’s dress in order to have a more complete understanding. My project really wasn’t focused on what the average woman wore or how she might have experienced dressing for cycling. It’s true that I could have analyzed articles for this information, but given the performative aspect of writing for the public (and late 19th century mores), I wasn’t comfortable reading that much into their personal experiences. Franky, just writing about what styles were recommended was a huge undertaking and certainly enough for one dissertation. As interesting as it might be to get at the identity of these women, that’s another project entirely. I’d love to look at diaries and letters, but I have no idea what I’d find. I am, however, planning to talk to cyclists living in the Twin Cities to learn about how cycling impacts/ relates to their personal style. The styles of dress have obviously changed greatly since the 19th century, but it will be interesting to learn how much the conversation has changed. Up next will be a description of an exemplary 1890s cycling costume. Even disregarding my appalling spandex and the mysterious plastic and foam object on my head, I bike in a way that would have horrified most late-nineteenth century lady cyclists. They would have looked askance at how I tend to hunch over my handlebars and called me a “scorcher” as they shook their heads. Many people disapproved of men scorching, but it was generally considered completely unacceptable for women to hunch over their handlebars. 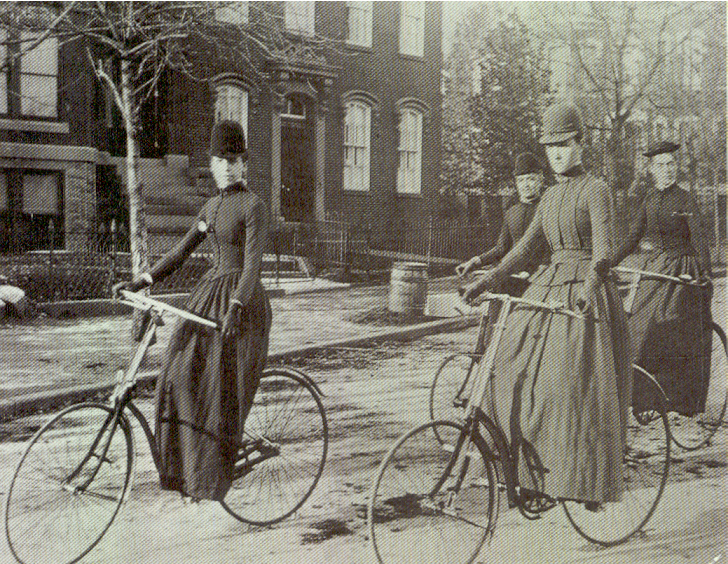 During the 1880s and 1890s, men’s bicycles tended to have lower handlebars than women’s. Racing bikes, which were generally men’s bicycles, had particularly low bars, known as drop bars, which are still used today. Some women, even those who did not race, no doubt preferred to lean over their handlebars for increased speed and wind resistance, but they were roundly criticized. Fast riding was for men who rode seriously, while a woman was meant to ride in a stately manner at all times. 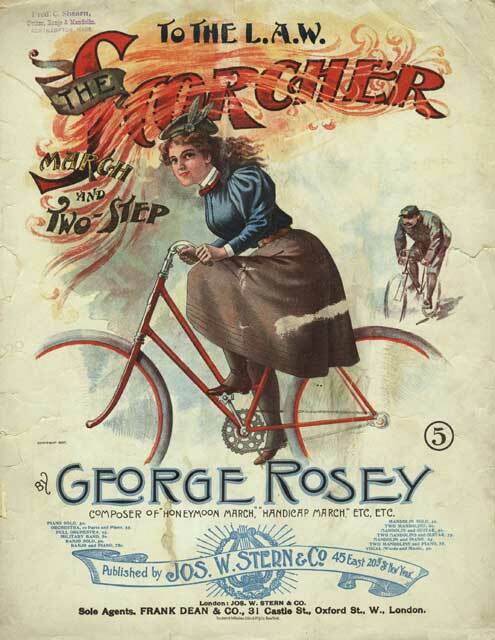 Of course, some women did race bicycles and preferred drop bars, but racing for women was largely discouraged. We are sorry. . . to notice an increase in the number of wheelwomen who ride with a pronounced bicycle stoop. This is a matter for regret, not merely because it is fatal to dignity and good looks, but because it indicates a desire of the part of a few woman to use the bicycle for speed, which is likely to turn it from an instrument of health to a means of peril. That is, it was not only unappealing, it was bad for women’s health to exert themselves too much! At least today, women are not as likely to be criticized for riding fast and even racing, although women’s racing does not receive nearly as much attention as men’s. Still, it is generally understood that the most “feminine” way to ride is in a dress while sitting up very straight. I am a bit conflicted about this as I sometimes ride in dresses because sometimes I am riding dressed up for my destination. Up until quite recently, I didn’t have a bike that was really meant to be ridden while wearing a skirt, and my only women specific bike was a hardtail mountain bike, which I use for riding trails almost exclusively. 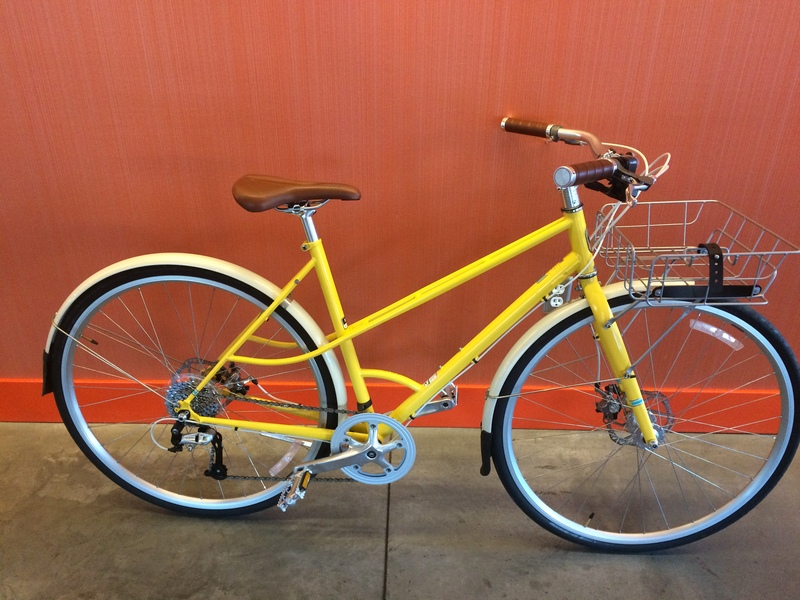 Then suddenly, I acquired a Trek Chelsea District*, which has a mixte frame. Public Bikes offers a handy guide on different frame types. Both men and women can and do ride mixte frames, but mine is sold as a women’s specific design, so it is designed to better fit women’s proportions (more on women’s specific design in a future post). Both of my other commuter bikes (a Salsa Casseroll and Trek Earl) have a more aggressive geometry, which means the bike has lower handlebars. Neither bikes are in any way meant for racing, but they are a bit more aerodynamic than the Chelsea. I never had much interest in a women specific city bike. Really, it is my husband’s fault for getting a similar bike for his very short commute and then deciding that I should have one too. As it turns out, though, the Chelsea is an excellent city bike. It has a basket with a place to hang a U-lock! I sit up straight so it is easier on my back. Also, I can sit up and look around much more easily, making cityscapes quite enjoyable. Now, I have no intention of giving up on other types of bikes, but there is something pleasant about riding upright on occasion, as it turns out. However, I prefer to think of myself as stately– a gender neutral term– rather than lady-like. *Full disclosure: My brother-in-law works for Trek, but I have no affiliation to Trek and this bike was purchased at a local bike shop.